About a dozen years ago, while in formation for the Permanent Diaconate in the Diocese of Trenton, an essay was shared with us from Cardinal Edward Clancy of Sydney, Australia, in which he spoke of the differences between deacons and priests centered on the liturgical ministry at the altar. The Cardinal pointed out that priests extended their ministry out to the community from their central position at the altar presiding at the Eucharist, while deacons joined the celebration of the Eucharist from the community as we gathered around the altar. I always found that distinction to be insightful to the ministry as a deacon, often sharing that I felt at times that I did more ministerial work in the coffee line at Wawa than in the church building. While something of an exaggeration, there is some truth to this idea, too. Much of the ministerial work of deacons takes place outside of liturgies, while preparing couples for marriage, and ministering to those in hospitals and hospice care. Over the past few years, the invitation from friends, family, and even just casual acquaintances to join them as they prayed for chronically or critically ill loved ones has marked special, sacred time in my ministry. I have been welcomed into the intimate circle of family members during times of crisis, when fears and emotions are strained, where God is challenged and questioned, and ultimately where the comfort of Jesus may be felt. I know that in a number of these moments of ministry, I was there because of my acquaintance through that community position more than from the altar. We are Eucharistic people. The Eucharist is the source and summit of our faith lives, but if left in churches as a liturgical experience, we have failed. 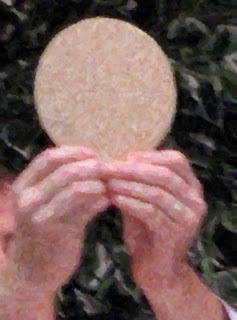 We are the People of God in community; Father Ron Rolheiser commented that, “The Eucharist is not a private devotional prayer, but is rather a communal act of worship that, among other things, calls us to go forth and live out in the world what we celebrate inside of a church.” When I consider the specific role of the deacon during the Eucharistic liturgy, I see that interaction with the community: the invitation to pray together in the Prayer of the Faithful; the invitation to share a sign of peace; and the charge to go forth and live the Gospel in our lives out in the secular world. As a permanent deacon these past nine years, I have been called to invite others to communal prayer and to carry the witness of the Gospel to classrooms and board rooms, to athletic fields and to kitchen tables. When I participate in the Eucharistic celebration, I am called to be a full and active member of the Body of Christ in every step of my weekly journey, with friends, family, business colleagues and strangers. This past weekend, I was able to gather with many at the Cathedral in Trenton as seven of my fellow seminarians received the sacrament of Holy Orders, ordained transitional deacons; with the grace of God, they will be ordained priests a year from now. They will learn many things in the next year, presiding at sacraments and sharing the Gospel in their words, actions and the witness of their lives. I pray that they will carry the hopes, dreams and fears of the parish communities they serve each time they stand at the altar with the priests presiding at the Eucharistic liturgy. And, I give thanks that I have been able to embrace and to be embraced by my parish community these past nine years as a permanent deacon. It is my hope and prayer that as my journey continues forward, I will always feel called to be from the community I serve, and to be amazed at the remarkable lives I am invited to share in as God’s minister. It is a blessing to serve God, and a grace to serve my fellow pilgrims in the Body of Christ. Please keep me, along with our newest transitional deacons – John, Carlo, Rafael, Jean, Augusto, Jerome and Mark in your prayers as we each move forward guided by the Spirit. One of my favorite books is 'Encounters with Silence' written by Father Karl Rahner, SJ. I encountered Rahner as one of the leading theologians of the 20th century while studying at LaSalle University. A real theology heavyweight, he served as an advisor at the Second Vatican Council - after doing battle with some Vatican theologians over the years. Much of what Father Rahner wrote makes for slow, deliberate reading, lots of notes, meaty ideas that make you think - and struggle a bit to understand. 'Encounters with Silence' is different; not quite one hundred pages long, this book is Rahner's conversation with God, about life, his vocation, how to pray, with chapter headings like "God of My Daily Routine" and 'God of My Vocation.' It is an amazing, intimate book, in that it holds the words of doubt and confusion that are part of all our prayer lives; Rahner, this giant of a figure in Catholic theological circles, had doubts and challenges which he laid out to God, who was clearly a personal friend on his journey of faith. This little blog space will share my thoughts on how God wanders into my life, or more accurately, when I notice He has wandered into my life again. Like all of us, I am on a pilgrimage here on spaceship earth. I'm a son, brother, father, uncle, cousin, brother-in-law, occasionally a golfer, musician, skier or coach - and a widower. Next weekend marks my 31st wedding anniversary, but I really stopped celebrating those after 2007, the year my wonderful spouse and best friend lost her battle to cancer months after our Silver Anniversary. And so, my pilgrim journey is taking a road infrequently traveled, as in about ten weeks I will be entering Immaculate Conception Seminary at Seton Hall University to commence study for the Roman Catholic priesthood. My story is a curious path, including being ordained as a permanent deacon in 2004. In my ministry, as deacon, husband, father and friend, I focus on adults building strong relationships of prayer with God. Personal conversations, contemplation rooted in scripture, or perhaps feeling God's presence differently when some familiar hymn opens up the scripture. As Rahner told many, we find God in all things, and especially in our daily routines. All it takes is for us to pause for a little or a lot of time and look for Him. I am joined on this road by many friends, but most especially by by three sons. My journey effects their lives, and their incredible support is why I can make a bold step in ten short weeks; these three young men, as they forge their own lives, where the first to call me 'Father' - more precisely 'Dad,' 'Yo, Pops,' or 'Papa Grogs.' It is my hope and prayer that this journey will result in my bishop and God calling me to serve them both as a priest; with confidence that God is leading me forward, I'll simply put one foot in front of the other, and link sacred days together into weeks and months. If you are reading this message, please keep me and all seminarians in your prayers - sort of a requirement for us, but we really do believe in the power of prayer, so I'll thank you in advance for those quiet moments when you ask Jesus and the Holy Spirit to guide our steps and ministry. Know that I will be returning the favor, keeping all my readers in my daily prayers. God of my life, I'm yours.